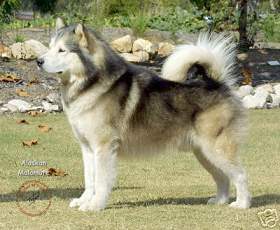 The Alaskan Malamute was named for an Inuit tribe, the Mahlemut. Originally used in hunting seals, set loose in packs to course polar bears, and to haul heavy sledges or pack in supplies — the Malamute was a true working animal. Also known as the legendary freighting dog of polar expeditions and served the military with valour during two World wars. Today the Malamute is mainly a companion dog. Some of the sports and activites the Malamute is involved in include: packing, weight pulling, sledding, cross-country and freighting, skijoring, carting, conformation, and obedience. The general appearance of the Alaskan Malamute should be that of a powerfully built dog with a broad, deep chest, large bone and a broad head. The Malamute has adapted well to warmer climates, although they are definitely an outdoor type that needs lots of exercise and prefers the winter months — an ideal choice for the cold-weather sports enthusiast. The outer coat is thick and coarse in colours from light grey to black with white, and he also has very distinctive markings on the face. They are self-confident, strong-willed, affectionate and friendly. Intelligent but often independent by nature, obedience training is strongly recommended for the new owner. While tolerant of existing family pets if raised with them, they are usually not tolerant of strange animals that they may come into contact with. Usually quiet, the Malamute does, however, carry on a conversation by "talking" in "woo-woos" (not barking) and may howl on occasion. 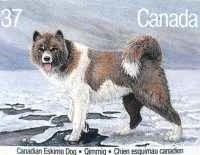 Originating from the Canadian Arctic, the Canadian Eskimo Dog is called "Qimmiq" by the Inuit and is the oldest indigenous breed still in existence in North America. The breed was popular with Arctic explorers and had a reputation as the sled dog that could pull the heaviest loads, over the greatest distances, on the least amount of food. In the 1950’s it was estimated that 20,000 Canadian Eskimo Dogs lived in Canada’s North. However, when snowmobiles gained favour, the number of Eskimo Dogs declined almost to the point of extinction. In the 1970s, a project, funded by the CKC, the Canada Council and private individuals saved the breed. Still, today it is estimated that there are less than 300 purebred CKC registered Canadian Eskimo Dogs in the world making the breed one of the rarest. The Canadian Eskimo Dog is a gentle and affectionate companion. The breed does not adapt well to temperate climates. He is primarily a working dog, born to pull and, therefore, needs plenty of outdoor exercise preferably in sub-freezing temperatures. The Samoyed is a member of the Spitz family and was bred by nomadic Samoyede tribes in northeast Siberia. A fine example of an ancient working dog, the breed is valued for its versatility as a sled, herding, guard and companion dog. The first dog to set paw on the South Pole was a Samoyed — the lead dog of Roald Amundsen's team in 1911. Today's Sams are still seen as sled, herding and watch dogs but also often seen in the Show ring, in Obedience, Skijoring and Agility competitions, and their gentle and friendly nature means that they make wonderful Therapy Dogs. The breed has an almost uncanny human understanding. Quick-witted, inquisitive and mischievous, and will remain playful well into old age. With their intelligent, sparkling eyes and ever present "Sammy smile", they are truly a gentle and companionable dog, independent yet loyal and devoted to family members. 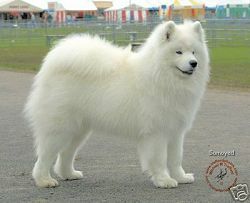 The Samoyed's glistening coat has a harsh, straight outer coat growing through a thick, close, soft and short undercoat. The colour most often seen is pure, sparkling white but cream, biscuit, or white and biscuit may also be seen. The Sam's appearance gives an impression of power, endurance, dignity, self-confidence and elegance. 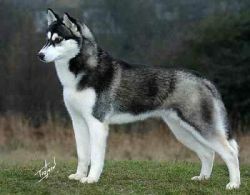 The Siberian Husky breed was originally developed as an endurance sled dog in northeastern Asia. In 1909, a large number of dogs were brought to Alaska to compete in the long-distance All-Alaska Sweepstakes races and the Alaskan dog drivers quickly recognized the abilities of these huskies from Siberia. The Siberian Husky is a medium sized, strong, graceful, and tenacious sled dog. Handsome, energetic, dignified, alert, eager to please, and very adaptable. Quick, light on their feet and graceful in action, they are extremely intelligent, independent, and can be very stubborn. Sibes however are affectionate, gentle and friendly. The Siberian has a strong predatory instinct and care must be taken around small animals, such as squirrels, rabbits, birds, guinea pigs, hamsters, and cats, which may be viewed as prey. Another characteristic of note for the breed is the desire to run. These characteristics are part of their heritage and it is important to realize that the Siberian is not a dog who can be left unrestrained as they will run if the opportunity is there for them to do so. The Siberian does not typically bark. Sibes talk in a soft "woo woo" sound and also howl quite well. The Siberian Husky has a thick, soft, double coat usually medium in length. The coat can be any colour with the most common being various shades of wolf and silver greys, tan, and black with white points. Siberians also have a large variety of markings, especially on the head. The eyes can be either brown or blue in colour. One brown eye and one blue eye is acceptable to the breed standard but is not preferred.